The Great Lakes are difficult to study during the winter. It’s cold, the ice is thick and there probably isn’t much going on under there, right? Clarkson University biologist Michael Twiss and other Great Lakes scientists have discovered there is a lot going on under the ice. Among the things he discovered is a high concentration of algae in Lake Erie during the winter. That’s unlike spring when there are almost no algae present. And it is an important discovery because algae growth has been linked to the creation of Lake Erie dead zones devoid of oxygen. 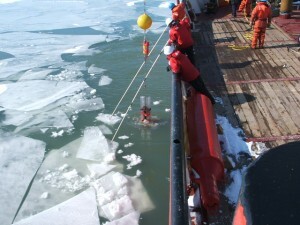 The Canadian Coast Guard provides Twiss and his team with an ice breaker. Their research is supported by the New York and Ohio Sea Grant organizations. Each year the team loads the ice breaker with supplies. Since it is not a vessel normally used to conduct scientific research, they have to bring everything with them, Twiss said. The journey begins in Amherstburg, Ontario, and ends at Lake Erie’s eastern basin not far from Buffalo. They collect random samples of water throughout the journey, he said. The information is especially important for efforts to shrink the dead zone. Cornelia Schlenk, the assistant director of the New York Sea Grant, said that agency supports the research because of its strategic plan to improve coastal water quality. Just how to stop or reduce the winter bloom is still unknown, Schlenk said. But the research Twiss and his colleagues are doing is getting published and put in the hands of the people who can use it. and the very last thing we need on the Lake Erie western basin is Fermi 3!!! We need to shut down Fermi 2, not let Detroit Edison build another reactor to raise thermal temperatures. Their most recent study is called “Diatoms abound in ice-covered Lake Erie: An investigation of offshore winter limnology in Lake Erie over the period 2007 to 2010,” and can be found in Volume 38, No. 1, of the Journal of Great Lakes Research, published by Elsevier. All results will be there! In the Sierra Club Great Lakes office, we’ve been carrying around a jar of Lake Erie “water” for months. It looks just like a jar of bright green tempera paint. And it never settles or separates. Detroit has the region’s largest wastewater treatment plant. Much of Lake Erie’s western basin has algae problems because of us. What kind of algae? Abundance? Abundance relative to the typical growing season? Any impacts on fish, other aquatic life? How long is this project? When are the results expected? I read where the larger zooplankton is the best at controlling algae. In one lake, (Culver) they planted predators to get the zooplankton eating fish knocked down (as they were high)and they even planted zooplankton. Viola, no algae, clear water and good fishin! We have too many planktivores from out of town (invasive) and we do have native predators that could control them.